Sometimes I want to ask God why he allows poverty, famine and injustice in the world when he could do something about it, but I am afraid he might just ask me the same question. While I was in Afghanistan there were several American civilians killed in reconstruction and stabilization efforts. Some I knew, some I only knew of, but each death filled me with despair. It takes a special person to voluntarily leave everything they know and work in dangerous areas of the world. Some people go for financial reasons, some crave adventure, but the vast majority of aid workers go because they have a sincere desire to help people who are suffering. When you make the decision to go to work in danger zones you have to accept and make peace with the reality that you could die or be injured. But seeing such a person lose their life is heartbreaking. In 2007, 29-year old USDA Forest Service employee, Tom Stefani, was killed when an armored vehicle he was riding in hit a roadside bomb. Working in Ghazni Province, he was developing and implementing an agricultural plan that included a poultry rearing facility, a cold storage facility and a grape production improvement project. While visiting an orphanage in Ghazni he learned that the children did not have enough toys and no playground equipment. He immediately launched a plan to raise money from family and friends for a playground for the orphanage. When Tom was killed his family created a fund to make sure his dream came true. 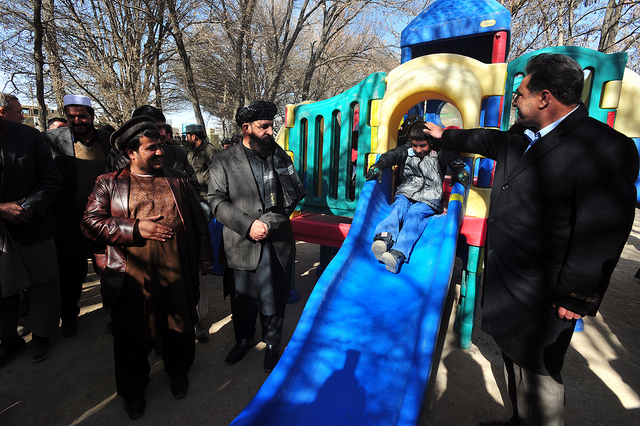 In 2010, that dream became a reality as a playground dedicated to his memory was erected at the Ghazni orphanage and he would have been thrilled to hear the children laughing as they played on the equipment. A fact that is often overlooked is that our wars are fought not only with soldiers, but with a great number of civilian workers going out alongside them. Civilian workers include military contractors who perform a myriad of tasks supporting military operations; government agency workers representing the U.S., journalists and nongovernmental (NGO) workers performing all kinds of missions — many of them humanitarian. Most people don’t realize that in 2007 there were actually more civilian contractors in Iraq than combat troops and that in 2009 contractor deaths exceeded military deaths in Iraq. According to a 2013 report of the Special Inspector General for Iraq Reconstruction (SIGIR): “In September 2007, the United States had more than 170,000 combat personnel in Iraq as part of the counterinsurgency operation, with more than 171,000 contractors supporting the mission.” To date, 1569 U.S. contractors have died in Iraq and 65 have died as part of the war in Afghanistan. The cost of war is high in blood and treasure and it can be deadly for civilians who choose to do their part to serve their country, to not only ensure freedom but also to try to make life better for the innocents who suffer the wraiths of war—disease, famine, poverty, displacement and terror. When civilians serve in high threat security zones they are often not working with the same pre-deployment training or the same support during and after their deployments that military personnel receive. Yet they too get injured and killed. And even when they return home safely — mission completed — they and their families can still suffer considerable psychological strain in the months and even years to come. But there is no Veterans Health Administration for civilian workers to turn to for support. And sadly we as a society are still slow to recognize our hundreds of thousands of civilians who serve in high threat and danger zones. While our military serviceman returning from Iraq and Afghanistan have faced disgraceful delays from the Veterans Health Administration to get their claims covered — civilian contractors who return from the battle space with similar injuries — including limbs blown off, traumatic brain injury, posttraumatic stress disorder (PTSD) and depression also have difficulty in receiving the help they need to recover. In terms of psychological well-being, a 2013 RAND study, “Out of the Shadows: The Health and Well-Being of Private Contractors Working in Conflict Zones” found evidence for PTSD in twenty-five percent of their sample, depression in eighteen percent, and alcohol misuse in over half the sample. And longer deployments and increased combat exposure was associated with higher rates of distress. Serving in a combat zone, high threat or danger zone is just that — dangerous — and it’s time we recognized the hundreds of thousands of civilians who risk their lives for others. A new organization, We Served Too (WS2), has been formed with the mission to raise awareness; conduct research; develop education materials; support resilience, health and well-being; and to create a web-based community, support network and information resource for those who are serving or have served in conflict and high threat security zones. We will never win wars by how much money we spend or by how many people we kill. If we have any measure of success it will be the on-on-one interactions that we share, interactions that civilians are in a perfect position to initiate. It is in the exchanged smiles, the touch of a hand, the expression of compassion where they see we are not all infidels and we see they are not all terrorists that real success can be found. We who served too don’t need parades or medals, but we would like to know that someone remembers that we were also willing to lay down our lives for our country. We would like to be remembered for reaching out to those who are suffering around the world. I used to pass by the flag pole at the U.S. Embassy in Kabul and see the memorial marker stone for Tom Stefani and many times I would pick a rose and lay it there because I wanted Tom’s family and friends to know that in the war torn country he loved, he was remembered.